There is a belief among packaging experts that shoppers can be convinced to buy a product if the package that contains the product caters to the right senses. Designers have spent years testing packages, doing market research studies, and logging reaction habits from various target groups, just to come up with the perfect appeal on the packaging of products. Color plays a major role in determining the best direction to go with packaging. It was not until after 1950 that attention was even given to what the container of a product looked like. Most items were generically packaged in functional wrappers designed to protect and deliver. But that has all changed. Today impulse purchasing makes up almost 75 percent of the consumer spending, and if the package fails to project the right message, it might be left sitting alone on the shelf. The use of bold versus soft colors. ​What kind of lettering to use. How big the lettering should be depending on the message. The placement of packaging banners. ​The size of the container. Promotional incentives that will placed on or in the packaging. Because of color trends and the fickle taste of shoppers, the average lifespan of a product's package is two and a half years. 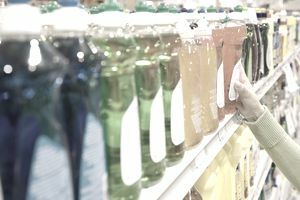 If a company does not invest in repackaging efforts, the product will look like yesterday's news and the products in updated packaging will be purchased more frequently. You might think the shape of a product's package is the key to coming up with a great design, but it is the color of the package that is the number one concern in package design. The design teams know that people react differently to different colors. Furthermore, through physiological response testing, individual patterns can be traced. Color sends subliminal messages to people, and most of us react the same to some colors. Manufacturers utilize this information to make products more appealing to shoppers.. Which colors do package designers believe will have the biggest impact on shoppers? Red is the most popular color for food packaging. Experts say that the color red makes the adrenaline increase and the heart beat faster. The color is used to grab shoppers' attention. Coca-Cola has long been associated with red. When manufacturers want to make an item appear bigger, they frequently turn to yellow as the dominant color on product packaging because it tends to ​make products look larger on the shelf. Yellow is also known as being one of the most visible packaging colors, which quickly grabs the attention of shoppers. The color white is associated with purity and freshness and is often used to create a "clean" feeling. It is the color more widely used for bathroom and kitchen packaging and dairy products. When manufacturers want a product's packaging to project the feeling of luxury, they turn to the color black. It is believed that shoppers often relate items packaged in black as being top quality, sophisticated and luxurious. The color green is often used on product packaging for low-fat and low-calorie foods. Although in the past green was never used because it was felt that it would make consumers think of moldy food, it is now back on the scene. It is often seen on low-cal packaging and as a highlighter on product banners to bring attention to the no-fat, low-fat labeling. Shoppers associate blue with water and sky. It is a soothing color when in the pale hues, and somewhat mysterious, like the ocean. These elements make blue a top color used on seafood packaging. Packaging experts believe that shoppers associate "cheap" when they see the color gold on product packaging. Therefore, it is often used on inexpensive or imitation generic packaging. A soft gold, however, is often used on products for children, because it is considered a happy and sunny color.